Descriptions of the desirable physical qualities of a hunting hound go back to Medieval books on hunting. All dogs used in the hunting field were gentle, that is of good breeding (not necessarily pure breeding), and parents were carefully chosen to maintain and improve conformation. In 1896, making some use of wording found in earlier descriptions, Edwin Brough and Dr J Sidney Turner published Points and Characteristics of the Bloodhound or Sleuth-Hound. 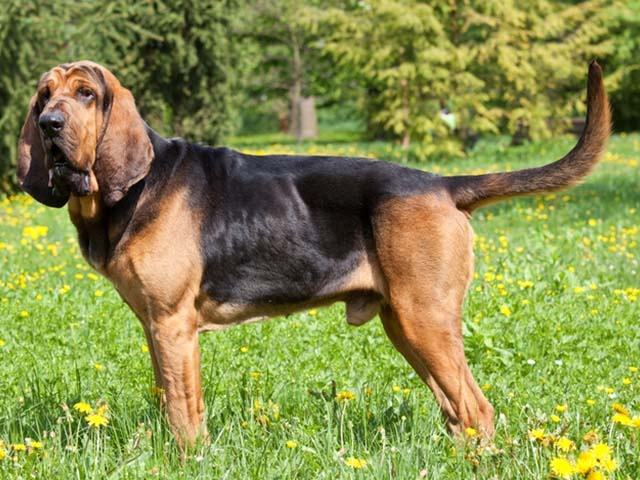 This was adopted by the newly formed Association of Bloodhound Breeders, and ultimately became, with very little change, the official breed standard of the KC and the AKC. Meanwhile, the Belgian or Dutch Comte Henri de Bylandt, or H A graaf van Bylandt, published Races des Chiens in 1897, a huge and very important illustrated compilation of breed descriptions, or standards. In this French edition the Bloodhound appears as the Chien de St Hubert, although the pictures illustrating the standard are all of British Bloodhounds, many of them those of Edwin Brough. The book was revised and reprinted in four languages in 1904, and in this edition the English text of the standard is that of the Association of Bloodhound Breeders, while the French text is closely based on it. However, the present FCI standard uses a quite different layout and wording. The AKC standard has hardly been altered from the original of 1896, the principal change being that the colours, black and tan, red and tan, and tawny, have been renamed as black and tan, liver and tan, and red, but the British KC has made considerable changes. Some of these were simply matters of presentation and did not affect content. However, responding to the view that the requirements of some breed standards were potentially detrimental to the health or well-being of the animal, changes have been made affecting the required eye-shape and the loose skin, the most recent revision being 2008-9.